Husk Spot, caused by Pseudocercospora macadamiae is a major fungal disease of macadamia in Australia, costing the industry in excess of $8 million in lost production annually. Although macadamia nuts can be infected at any time, yield-limiting infections occur from match-head to full nut size (roughly Late Nov/Early Dec). The visible symptoms develop slowly, appearing first on the green husks as chlorotic spots, which then darken to form the characteristic necrotic brown lesions with a yellow halo. Varieties sensitive to the husk spot pathogen will typically drop nuts 4 to 6 weeks earlier than non-infected trees, these nuts are usually immature and unsuitable for processing. Husk Spot lesions on green and dried husks, including stick tights, can produce viable fungal spores for many years. Appearing as a greyish mat in the center of the dark brown spots, the condidia are easily dispersed by rain splash onto developing nuts. An integrated management approach should be adopted to reduce the source of the inoculum includes the use of a protectant fungicide program containing fungicides from different chemical groups. 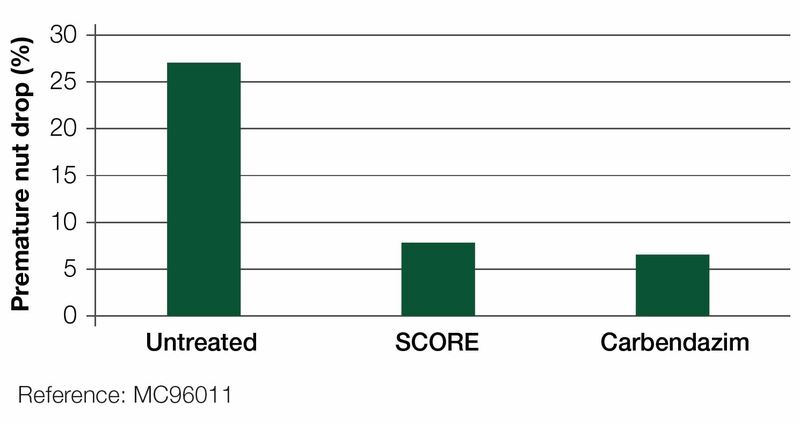 SCORE® Foliar Fungicide (Group 3) when applied at 50 mL/100 L provides excellent control of Husk Spot. Formulated as an emulsifiable concentrate (EC), SCORE contains 250g/L difenoconazole making it a member of the DMI group of fungicides (Group 3). Studies have shown that SCORE has no obvious effect on spore germination, formation of appressoria or on the penetration of hyphae. However, the active ingredient does have significant effect on the development of the subcuticular growth of mycelium which prevents the development of disease symptoms. The maximum uptake of SCORE is reached within about 2 hours, at which time it is rainfast. The total amount of SCORE taken up by the plant can be affected by a number of factors including the nutrition level of the plant, moisture stress, damaged plant tissue (i.e. insect damage etc.) and environmental conditions (i.e. high temperatures and low relative humidity). 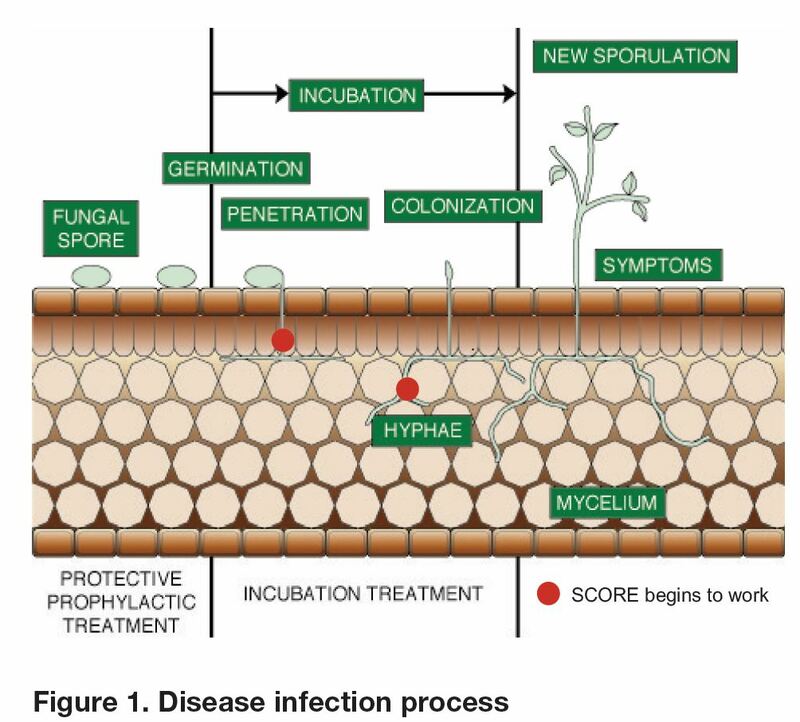 SCORE is locally systemic, with a strong translaminar activity which means the active ingredient penetrates the plant forming a reservoir inside the husk. Inside the plant the concentration of the active ingredient remains relatively constant for a period of up to 21 days. 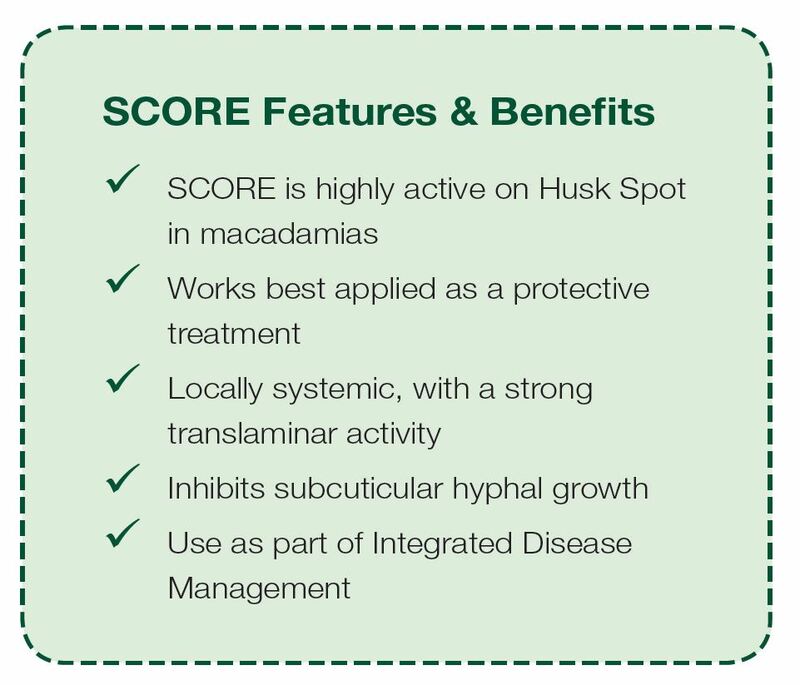 Over many years SCORE has proven to be outstanding for the control of husk spot in macadamias. Used in a preventative fortnightly spray program in the Glasshouse Mountains, Queensland, two applications of SCORE at 50mL/100L followed by two applications of copper oxychloride provided equivalent control to two applications of carbendazim at 50mL/100L followed by two applications of copper oxychloride (variety A16, A4). The impact of husk spot is often most visible as extensive premature abscission of nuts. In another trial at the Glasshouse Mountains, two applications of SCORE at 50mL/100L reduced premature nut drop by 71% compared with the untreated control (variety A16). 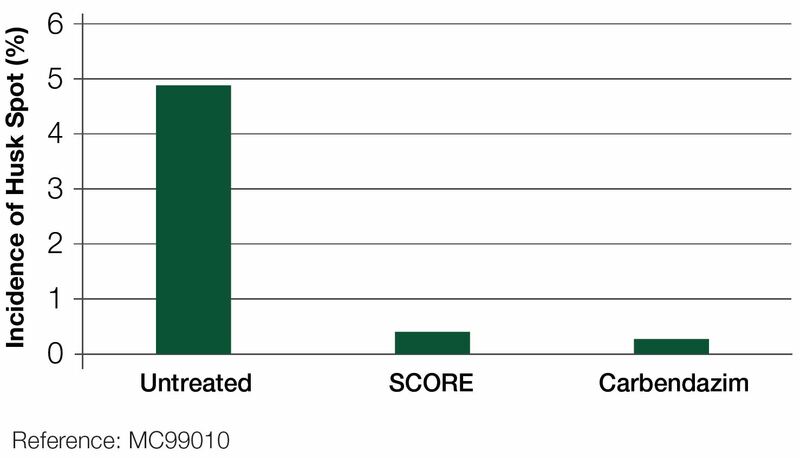 In this trial two applications of carbendazim were applied at 75mL/100L (N.B. : carbendazim at 500g/L is only registered at 50mL/100L).